Mcm10 is a eukaryotic DNA replication factor that regulates the stability and chromatin association of DNA polymerase alpha PMID:15494305. 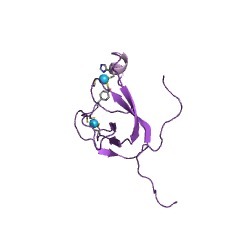 This entry represents a domain found in the C-terminal region of the Mcm10 protein, which is a eukaryotic DNA replication factor that regulates the stability and chromatin association of DNA polymerase alpha [(PUBMED:15494305)]. There are 695 Mcm10 domains in 695 proteins in SMART's nrdb database. Taxonomic distribution of proteins containing Mcm10 domain. This tree includes only several representative species. The complete taxonomic breakdown of all proteins with Mcm10 domain is also avaliable. Click on the protein counts, or double click on taxonomic names to display all proteins containing Mcm10 domain in the selected taxonomic class. Mcm10 regulates the stability and chromatin association of DNA polymerase-alpha. Mcm10 is a conserved eukaryotic DNA replication factor whose function hasremained elusive. We report here that Mcm10 binding to replication origins inbudding yeast is cell cycle regulated and dependent on the putative helicase,Mcm2-7. Mcm10 is also an essential component of the replication fork. A fraction of Mcm10 binds to DNA, as shown by histone association assays that allow for the study of chromatin binding in vivo. However, Mcm10 is also required to maintainsteady-state levels of DNA polymerase-alpha (polalpha). In temperature-sensitive mcm10-td mutants, depletion of Mcm10 during S phase results in degradation of thecatalytic subunit of polalpha, without affecting other fork components such asCdc45. We propose that Mcm10 stabilizes polalpha and recruits the complex toreplication origins. During elongation, Mcm10 is required for the presence ofpolalpha at replication forks and may coordinate DNA synthesis with DNA unwindingby the Mcm2-7 complex.